For years advocates have been trying to pass workplace bullying legislation in Vermont. 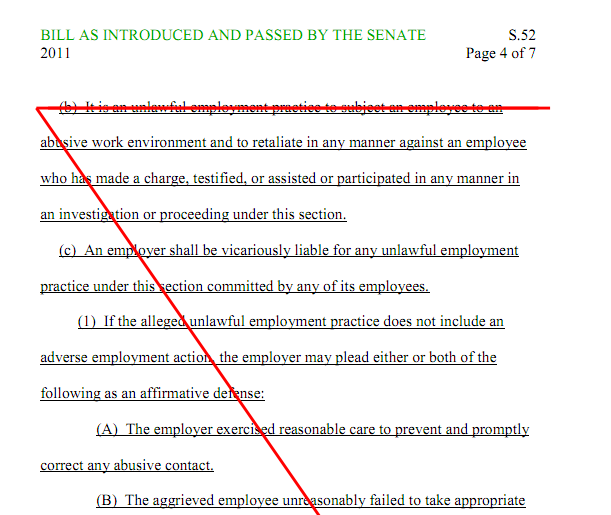 Last year, SB.52 started as yet another attempt to re-introduce the Healthy Workplace Bill (aka Abusive Work Environment Act). But, this time something happened. Instead of dying in committee, the language was completely struck and totally rewritten to ensure that lawmakers look into all possible approaches before adopting legislation that will impact both employers and employees throughout the state. (After all, isn’t that what our elected officials are supposed to do?) The Senate wants a task force created to determine the best way to provide relief and redress for state residents suffering in abusive work environments. The new version of SB.52 became very active and passed the Senate. If it makes it out of the general committee and is passed through to the Governor’s desk, the task force’s findings could create a landmark moment for those of us who would like to see bullying legislation become a reality. The Vermont office of attorney general’s civil rights unit reports that of the 1,200 to 1,300 requests for assistance it receives each year, a substantial number involve allegations of severe workplace bullying that cannot be addressed by current state or federal law or common law tort claims. Similarly, the Vermont human rights commission, which has jurisdiction in employment discrimination claims against the state, reports that it must refuse complaints of workplace bullying because the inappropriate behaviors are not motivated by the targeted employee’s membership in a category protected by antidiscrimination laws. Personally, I like this approach because I’d really like to see legislation enacted to insure that employers protect their workers. But, I’m not sure what type of legislation would be best. In Ventura County they were able to expand workplace violence policies, already in place, to address bullying. Nevada is considering legislation that expands discrimination legislation to address bullying. I like these approaches because it removes the onus of malice and health harm required for Tort. Malice can then be set aside for punitive damages. I also like the idea of an agency being involved that can help protect both the employer and the employee. And, who knows, they may decide, after rigorous review, that the original text of SB.52 is the way they want to go. In 2009, NY passed a similar study bill through both houses but was vetoed by then Governor Paterson. Had the bill been signed there might well be bullying legislation in my home state. (1) A definition of “workplace bullying” or “abusive conduct” in the workplace not addressed by existing law. (2) Whether there is a need for additional laws regarding workplace bullying. (A) Creating a private right of action that would include the recovery of damages. (B) Creating a mechanism for injunctive relief similar to those relating to stalking, hate crimes, or relief-from-abuse orders. (C) State enforcement similar to the employment discrimination law. (D) State enforcement by the Vermont occupational safety and health administration. (E) Any other issues relevant to workplace bullying. (b) The committee established by subsection (a) of this section shall also recommend any measures, including proposed legislation, to address bullying in the workplace. (1) The attorney general or designee. (2) The executive director of the human rights commission or designee. (3) The commissioner of the department of labor or designee. (5) The state coordinator of the Vermont healthy workplace advocates. (6) Two representatives from the business community, one to be appointed by the speaker of the house and one to be appointed by the committee on committees. (7) Two representatives from labor organizations, one to be appointed by the speaker of the house and one to be appointed by the committee on committees. Here’s a link to the text of the version of SB.52 that passed. This entry was posted in Arbitration_Mediation, bullying, definitions, Legislation, Uncategorized and tagged bullying, business, harassment, healthy workplace bill, hostile workplace, the_excerpt(), workplace bullying by bullyinworkplace. Bookmark the permalink. As the Vermont State Coordinator who has had the bill introduced since 2007, I have been lobbying since 1999, the Whistleblower Bill for Healthcare Worker that passed in 2004, I helped with the Bullying Laws for schools and now the Healthy Workplace Bill S.52. I have talked with targets for over a decade, Vermont is unique in many ways, but not when it comes to bullying. I was there in the Senate Hearing on Workplace Bullying and I heard the Washington County Asst. Atty. General speak. Vermont has fourteen counties so the other thirteen counties were not there to report the number of calls they received. The Asst. Attorney General defended not doing investigations assuming they were disgruntled employees who did not get a raise or a promotion. I nearly went into shock since I have helped dozens of people to file forms and only one got investigated and she would be given her paperwork only days before the deadline she could file an action and was told to get a private lawyer. Our State is no different than other states, we do not have the staff or the money to deal with bullies at the State level. The truth is we need to have this civil to save the State and it’s citizens money so if we are going to Stop Bullying or continue what the State has in the past then the only way to make the Healthy Workplace Bill Law would be to do it Civil Courts otherwise the bill will only be letters on a page with not meaning. Sherrill Gilbert Vt. State Coordinator healthyworkplaces4v@charter.net I have been assure by the Chair of the Housing and Military Affairs today that there will be Hearings in March, the priority is the House Bills on Huriricane and the need for housing.